If you have embroidery software installed on your computer, then you can use it to open embroidery designs. Reference the software's instruction manual to find the steps. Usually the steps are as simple as opening the software and choosing "file" and "open" from the software's toolbar. If you do NOT have embroidery software installed on your computer, then do not attempt to open embroidery designs on your computer. 1. Embroidery software is not installed on the computer. 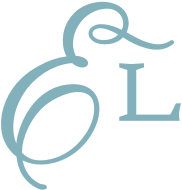 If you want to open designs on your computer, you need to have embroidery software. If you don't have embroidery software on your computer, then don't attempt to open designs. There are many different kinds of embroidery software programs. Wilcom's TrueSizer is a free program. Embird is a low-cost program with excellent editing capabilities. You may have heard of other programs like PE Design, Buzz Tools, Palette, Bernina Editor, Artlink, Customizer, Horizonlink, Husqvarna 3D, 4D, 5D, 6D. There are dozens of programs that range in price and capabilities. Embroidery software isn't pre-installed on a computer when you buy it. It's something that's installed after. If you upgrade to a new computer, remember to install your embroidery programs. Some embroidery software programs cannot open zipped files. If yours cannot, unzip the file and extract the embroidery design. Then use the software to open the design. Click here for instructions for unzipping on a PC, and click here for instructions for unzipping on a Mac. 3. Double clicking on the design gives an error message. When you double-click on a file, that sends a message to your computer advising that you want to open the file. If your computer doesn't know which program to use, it might choose something basic, like Paint or Media Player or Adobe, or give you a "Windows doesn't know which program to use to open the design..." error message. If you have embroidery software installed on your computer, make sure your computer has the correct "file association" between the file and the software. For example, if I want to always open PES files with Embird, I would set a "file association" in my computer between Embird and the PES extension. Then, when I double-click on a PES file to open it, my computer will use Embird to open the file. The steps for setting a file association will vary depending on your computer's operating system. In most instances you can right click on a design that is on your computer, choose "open with," and select the embroidery software that you have from the list of recommended programs. 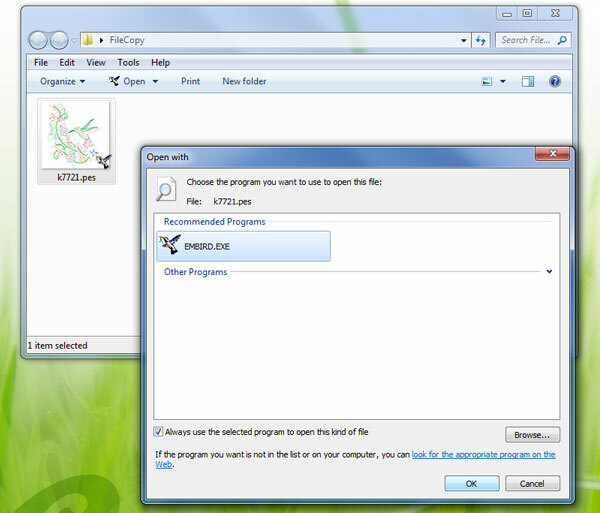 Then, check the box that says "always use the selected program to open this kind of file." If you have questions about the above, let us know! Send an email to support@emblibrary.com. In your email, include your order number, the name of the embroidery software program that you're using, and a description of the problem.